Smoke from California's many wildfires spreads as far east as Salt Lake City in this image, which was captured by NASA's Aqua satellite on July 29, 2018. A dramatic new satellite photo shows the destructive reach of the wildfires raging across California. 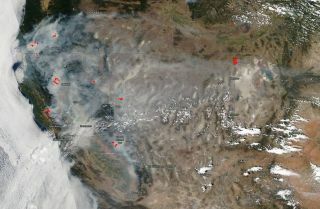 The image, which was captured Sunday (July 29) by NASA's Earth-observing Aqua satellite, depicts smoke blanketing much of the Golden State and spreading as far east as Salt Lake City. Much of that smoke is coming from the Carr Fire, a dangerous and fast-moving blaze centered near the Northern California city of Redding. As of Monday morning (July 30), the Carr Fire had scorched nearly 100,000 acres (40,500 hectares) and was just 20 percent contained, according to the California Department of Forestry and Fire Protection (Cal Fire). The Carr Fire has killed six people to date. To the southwest of the Carr conflagration are the River and Ranch fires, which together form the "Mendocino Complex." These two blazes have consumed a combined 56,000 acres (22,700 hectares) to date, and each one is just 5 percent contained, according to Cal Fire. Then there's the Ferguson Fire, which has been burning near Yosemite National Park since July 13. Ferguson has blackened nearly 56,700 acres and is 30 percent contained, Cal Fire reports. Two firefighters have been killed battling the blaze to date. And those are just the biggest, most prominent blazes; numerous other fires have broken out around California, and throughout other Western states. To get the latest updates, go to Cal Fire's "Incidents" page. The Aqua satellite launched in May 2002, tasked primarily with studying Earth's water cycle. But the spacecraft can make a variety of other observations as well — helping researchers and first responders keep tabs on wildfires, volcanic eruptions and other natural disasters, for example.